Big, 40” x 60” Print of the Beautiful, New USDA Plant Hardiness Zone Map. Genuine Offset Lithography! 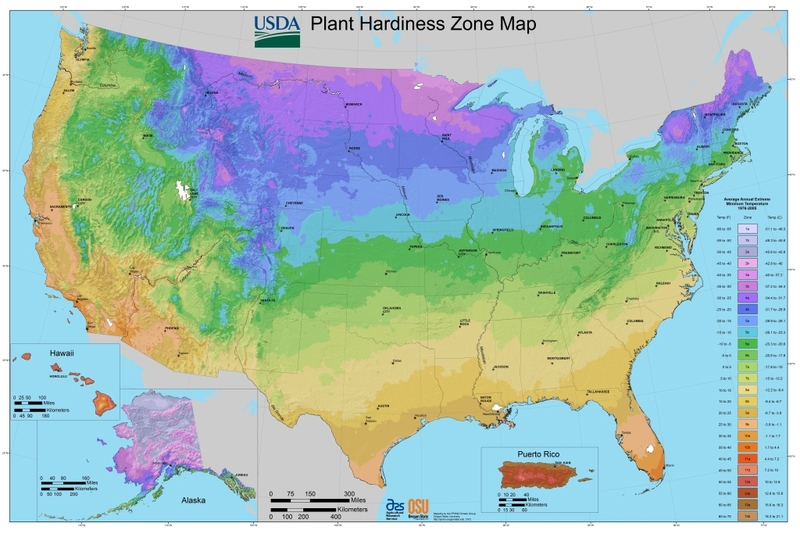 I have just launched a Kickstarter project to print the New USDA Plant Hardiness Zone Map. We think it’s a beautiful map, and can’t be fully appreciated on a screen.It deserves to be seen at full size: A big, 40 x 60 inch print of the beautiful, new USDA Plant Hardiness Zone Map, printed by genuine offset lithography! Kickstarter is a new way to fund creative projects: I have set a funding goal and deadline for my project. If you like the project, please pledge money to make it happen. I am excited by the possibilities of crowd sourced funding for creative map projects. Print and digital are both improved when used together. Funding on Kickstarter is all-or-nothing — projects must reach their funding goals to receive any money. Backers of the project will receive the a big, 40 x 60 inch print of the beautiful, new USDA Plant Hardiness Zone Map, printed with genuine offset lithography. Update: This Kickstarter project was successfully funded and printed. We have a few left. Let me know if you want one. Capitol Heights, MD, July 8, 2013: Williams & Heintz Map Corporation, a specialist in map printing, production, and folding, is pleased to announce that it has received certification as a Minority Business Enterprise (MBE) from The Maryland Department of Transportation’s (MDOT) Office of Minority Business Enterprise (OMBE). Williams & Heintz Map Corporation has been printing maps for entrepreneurs, government agencies, and map publishers since 1921. They combine the highest quality pre-press, printing, folding with industry leading knowledge and customer service. “We are excited to be officially certified as a Minority Business Enterprise for Commercial Printing and Support Activities for Printing. We look forward to the opportunities that certification will bring,” said Holly Heintz Budd, President and CEO of Williams & Heintz Map Corporation. MDOT’s OMBE is Maryland’s Official Certification agency. They have one of the most stringent certification processes in the U.S. To be eligible for certification as an MBE firm, a business must be at least 51% owned and controlled by one or more socially-and economically-disadvantaged individuals, including women. MDOT has a comprehensive certification process to determine the ownership and control of firms. Only certified firms are eligible to fulfill minority participation goals on contracts issued by the state of Maryland. Created by The Regional Centre for Geographic Information Provence-Alpes-Côte d’Azur (CRIGE PACA). It was shown during meeting, a conference called SIG La Lettre. “Here’s how it works: Map consists of a large window, integrated in a flexible cellulose pad, and compressed hundreds of times, thanks to the FUF technology: folding/unfolding. “Map” is able of storing millions of information bits, which are then optically scanned, and thus directly transmitted to the brain. Thanks to a particularly ergonomic navigation interface, based on an intuitive forearm supination and pronation mechanism, pans, zooms and rotations are performed without image degradation, smoothly, with a refresh rate of a few picoseconds. It has a 100% toutchpad allowing simultaneous use of 10 fingers. “Map” respects users’ privacy: impossible to hack, and without any antivirus or firewall, annotations are locally stored and never sent to any server. 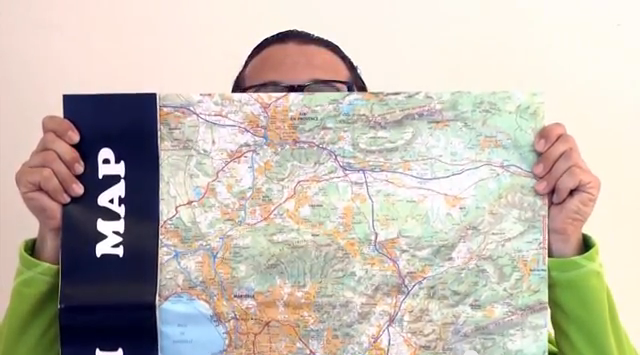 Finally, the video reminds us that a print map is great for decorating, and is a recyclable, sustainable, product. ‘Map is an unprecedented technological revolution: Without cables, without electronics, without connection, compact, convertible and portable. “Map” can be used everywhere: at home, at the office, in the car, by bicycle, horseback riding, even in extreme cold! “Map” is available at any time… without battery, nor socket. “Map” does not crash ever. “Map” does not need to be reset nor updated.